After one of the longest winters that I can remember, it felt quite exciting to finally put all my winter gear in storage and switch to easy tee shirts and jersey dresses. There was, however, one downside – all the cream, cheese and butter-laden recipes I’d been posting to help you brave the elements, had left a couple of unwanted inches around my waist . Time to go easy on the béchamel, pasta and desserts for a week or so! Today, I am treating myself to a salad made with red radicchio (probably my favorite leafy vegetable). and the exotic addition of Medjool dates to temper its slight bitterness. Let me know what you think! Peel the onions and slice them into quarters or eights depending on the size. Heat 2 tbsp oil in a skillet on low heat (prefer a heavy or non-stick skillet); add onions and thyme, and cook for 10 minutes covered, stirring often. Sprinkle with the brown sugar and cook, stirring until caramelized. Add the balsamic, and cook covered for 15 more minutes, still stirring frequently to prevent the onions from sticking. 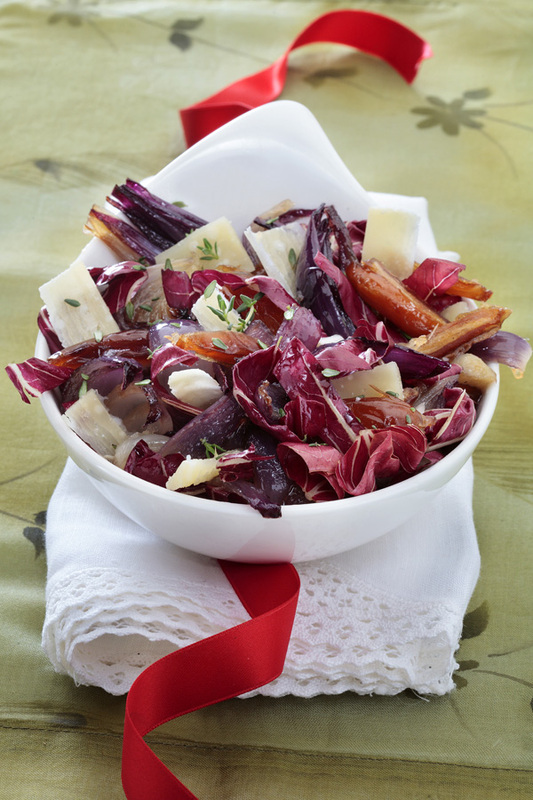 In the meantime, cut the washed and dried radicchio into strips and arrange them into individual bowls. Add the warm, caramelized onions, the cheese shavings and the pitted, coarsely chopped dates. Deglaze the pan with the remaining 1 or 2 tbsp oil and 2 tbsp water, pour onto the salad (filtering first if needed), and serve! This is such a beautiful photo! I can’t wait to try this salad. It has indeed been a long, long winter… but it’s finally over. Fingers crossed. I’m with you on radicchio, can’t get enough of it. Never had madjool dates, though—will have to try them soon. What an intriguing combination of flavors! I am going to try this soon. This look really great. Flavour combination is fabulous.